(Beijing) — Japan’s SoftBank Vision Fund announced in February it would invest $1.5 billion in Chehaoduo Group, which operates one of China’s leading online used-car marketplaces, Guazi. 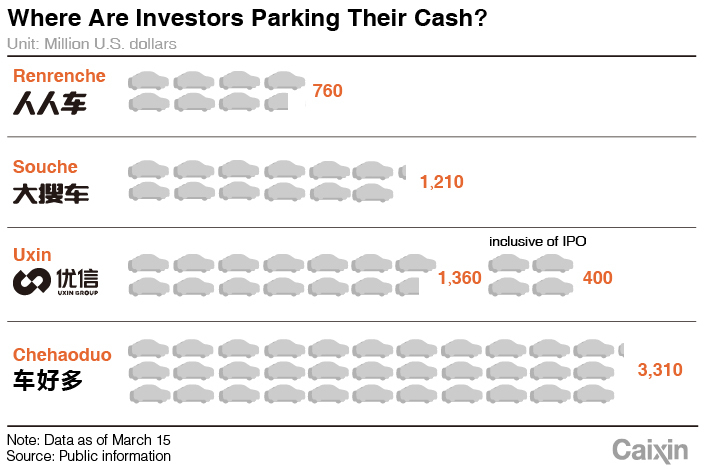 The investment values Chehaoduo, which translates as “so many cars,” at more than $9 billion. The company, which counts Tencent Holdings Ltd. among its investors, said it would use the new funds to improve its technology, spend more on marketing and expand its physical footprint. “Physical footprint” is the keyword here. China’s used-car market is a rising segment with great potential and market watchers said internet marketplaces are set to extend their battleground from online to offline this year — with more bricks-and-mortar locations slated to open. Similar to tech giants like Xiaomi Corp. — which started as an online-only smartphone retailer but moved into physical stores to boost brand recognition — online used-car marketplaces are pouring cash into service centers at which customers can speak with staff, see vehicles in person and get repairs. China is the world’s largest auto market, but used-car sales still make up a small part of total sales. In 2017, twice as many new cars were sold as used ones in China, compared to the U.S. where around 2.4 times as many used cars were sold, according to iResearch. Used-car sales grew by 11.5% last year to 13.8 million units, according to the China Automobile Dealers Association. An estimated 3.2 million of those cars were sold online — double the number of used cars sold online in 2017. “Guazi is moving toward a combination of both the online and offline retail models. 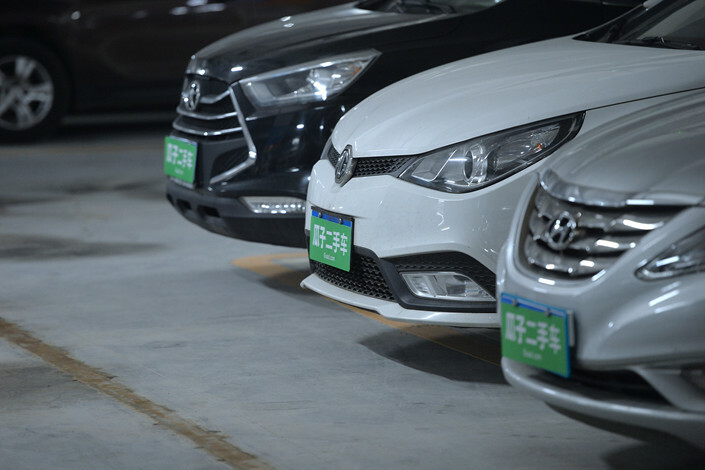 We want to offer a better user experience — customers can find information about used cars, then come to our stores for transactions and services,” said Chehaoduo Chief Operating Officer Lei Yanqun at the opening of a Guazi service center in Shenyang, Liaoning province, in September. The center has a 500-car lot for displaying used vehicles and offers consultations, inspections, financing, insurance and aftermarket services. Caixin understands that Guazi has several business models for its new offline program. Guazi will first pay sellers half the price of the used car upfront before showcasing them at its centers. When a car is sold, the company will charge buyers 9% of the transaction value and charge the sellers 4%, in the form of a service fee. There is also a financing model where buyers will pay a lower service fee if they take up a loan. 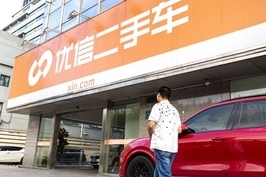 An industry source told Caixin that Guazi will use part of the latest investment to improve the data analysis process used to assess the market prices of used cars more accurately and thereby boost profitability. Guazi mostly chooses deserted factories to convert into service centers, typically spanning an average 20,000 square meters (215,200 square feet) to 30,000 square meters, on the outskirts of major cities. Since it opened its first center six months ago, the total number has ballooned to over 100. Another industry insider seconded this. The person said spending 1 million yuan ($148,985) to open a center is easy, but what matters over the long term is skilled repair people, effective quality checks on vehicles and an economy of scale large enough to ensure constant supply of auto parts. And Guazi is not alone. The Goldman Sachs-backed Renrenche followed suit in September by opening its first batch of physical stores. It had locations in 17 cities as of December, and said expanding its footprint is its major focal point this year, without offering details. Uxin Ltd., the first used-car platform to combine the online and offline models, introduced franchising in the fourth quarter last year. As of February, more than 600 franchisees had signed up. Uxin hopes that these partners will open 1,500 locations across China by the end of this year. According to the listing prospectus it issued before floating in the U.S. in last June, Uxin had over 670 service centers and seven regional transaction centers that covered more than 270 cities in China as of March 2018. In October, the Alibaba-invested Souche.com, meaning “searching for cars” in Mandarin, inked an agreement with state-owned PetroChina Kunlun Hospitality Co. Ltd. to open used-car outlets at more than 20,000 of the latter’s gas stations. Souche outlets will be opened at stations in the southern provinces of Guangdong, Yunnan and Zhejiang before being tested elsewhere in the country. 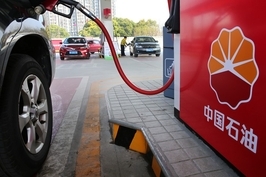 Since China has about 110,000 gas stations nationwide, this deal could involve up to one-fifth of the country’s gas stations. Souche has suggested that while some gas stations will host showrooms, others will likely just offer customer services, including test-drives.